This building was built in 1929 for Charles R. Ruegger's "Bazar Francais." Click here for Bazar sign painted on the wall of the building next door (668 6th Ave.). 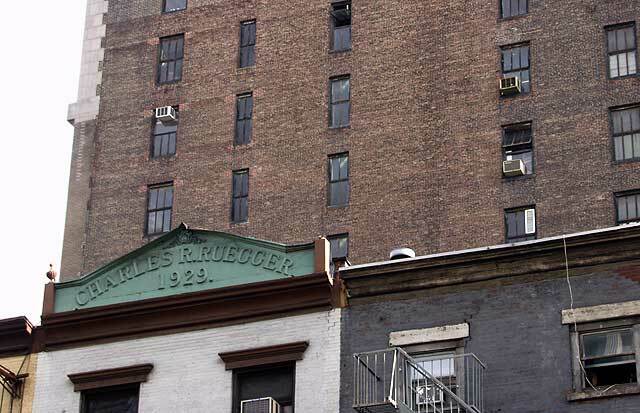 There are also Bazar and Ruegger signs at the 2nd and 3rd story levels on the front at 666 6th Ave. Click here for image. Yet another Bazar Francais sign was revealed in Feb. 2008 when renovation work was done on the shop front at the street level of 668 6th Ave. Click here for image. Around the mid-1890s this section of Fifth Ave. was renamed West Broadway. It was also around this time that Ruegger began using the term Bazar Francais to reflect his specialty in imported French kitchen and table ware. At the time of his death at age 78 in 1931 Ruegger was described as a dealer in hotel supplies. (They sold to individuals as well as stores and other businesses.) The business carried on under his son Charles H. Ruegger (1879-1967), son-in-law Victor L. King (1881-?) (he married Charles R. Ruegger's daughter Eugenie), and grandson Charles O. Ruegger (1908-1964). In 1963 the fourth generation of Rueggers, Charles E. Ruegger (1943- ), joined the firm. Around 1930 Ruegger opened a metalware shop on 19th St. between 5th and 6th Aves., where they made metal ventilators and heating-related ductwork. During World War II the Ruegger metalware shop was contracted by the government to do repairs on ships. After the war the shop began to manufacture copper pots and pans. In the mid-1940s the Bazar Francais featured a complete line of copper pots and pans and cast iron pots (some imported from France, others manufactured in the company's own factory). They were, in fact, the very first gourmet store in the US. Recently (Jan. 2004) Charles E. Ruegger wrote that he remembered "a young man coming into the store in the late 60's to buy our copper pans for his newly opened store which was called Crate and Barrel." The business continued in its 6th Ave. location until 1975. This ad appeared in the Manhattan telephone directory in 1937, and this one 32 years later (1969). Many thanks to Charles E. Ruegger for his help with much of the information above.